Trabecular bone tissue failure can be considered as consisting of two stages: damage and fracture; however, most failure analyses of 3D high-resolution trabecular bone samples are confined to damage mechanisms only, that is, without fracture. 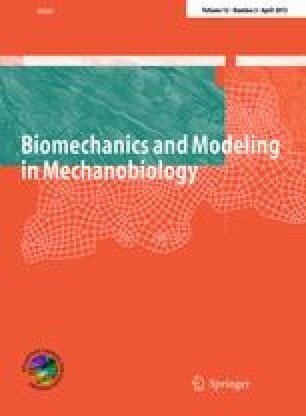 This study aims to develop a computational model of trabecular bone consisting of an explicit representation of complete failure, incorporating damage criteria, fracture criteria, cohesive forces, asymmetry and large deformation capabilities. Following parameter studies on a test specimen, and experimental testing of bone sample to complete failure, the asymmetric critical tissue damage and fracture strains of ovine vertebral trabecular bone were calibrated and validated to be compression damage −1.16 %, tension damage 0.69 %, compression fracture −2.91 % and tension fracture 1.98 %. Ultimate strength and post–ultimate strength softening were captured by the computational model, and the failure of individual struts in bending and shear was also predicted. This modelling approach incorporated a cohesive parameter that provided a facility to calibrate ductile–brittle behaviour of bone tissue in this non-linear geometric and non-linear constitutive property analyses tool. Finally, the full accumulation of tissue damage and tissue fracture has been monitored from range of small magnitude (normal daily loading) through to specimen yielding, ultimate strength and post–ultimate strength softening.